I have to say, I don't know how I can fail my weight loss journey with a cheering squad like you all. You also gave me some great hints and advice. I got on the treadmill for 30 minutes last night and today I'm going to visit the YMCA to see if I want to join. It's only $53/month for a family membership and Husband and Son want to go to swim laps. I want to use their step aerobics classes, circuit training, free weights, spin classes, and maybe even swim aerobics when I feel more comfortable about putting on a bathing suit. Thank you for all you wonderful words of support. And to you who want to join me in my journey, I'd be more than happy to have you. You can also email me at sherril @ rock-art dot com. Eliminate the spaces, of course. I have been doing some sewing this year. I'm trying to sew only from my stash until my trip to New York in March. I have plenty of fabric that I want to sew right now, so I'm staying away from the on-line stores and nothing in JoAnn's even tempts me. I'm also trying to save all the $$$$ I can for NY fabric shopping. I can't wait to see how it compares to LA fabric shopping. Since I've gained so much, I had to make a new pair of jeans and add to the CF to get more belly room. I'm calling these my fat pants. It's just my TNT pattern with the CF pivoted out from the crotch point 3/4 inches. The back is baggy because I'd been wearing them all day and I used a cotton/lycra blend to make them. The design on the pocket turned out great but is too subtle. I should have used darker thread and filled in the shapes. It's a free-motion quilt design. I think my free-motion skills are still pretty good for not doing any quilting for a few years. I also made another version of my CWC tie-neck top. I really love this pattern. I hope you all use my tutorial and make your own version. My next one will be a red/black argyle knit I got from Carolyn (Thanks!) with black sleeves and tie. I think it'll look like a vest over a black top, at least that's the look I'm going for. 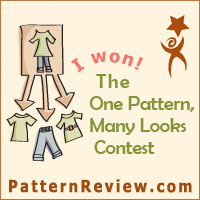 On Patternreview, I saw a thread where Izzie wanted to knock-off this top from MyShape. I really liked it too and thought I could try to draft the pattern. This is the largest image I could capture from the website. You can't see it very well unless you go to their website and use the magnifier on the details. I'm not linking because it won't be on their site for very long. Here's my pattern draft. You can see that I had to spread the front 1/2" to get a seam allowance in the dart. I think it looks like that's what they did in their version too. In case you were wondering, I always leave a bit of pattern tissue hanging from the center front to remind me that I need to put it on center fold. I'm sorry the picture didn't turn out better. The reason I slashed into the underarm is because this gives me the least amount of distortion. Instead of pleats, I'm going to use gathers. I think it will be much easier and the effect will still be the same. I have it cut out in a dark red rayon jersey knit but haven't sewn it up yet. I have a four day weekend starting today, so I'll try to get it done sometime today or tomorrow. It shouldn't take very long. "I'm calling these my fat pants." OK, I've got ONE pair of "fat pants", too... But, the best way for me to proceed is to see myself well-groomed & smiling. Someone of value--even with a load extra. Although I've gained ## since "our" son, Erik, saw me, he didn't care/comment/"notice". We laughed, shared, cried... With all of my extra weight. For "fat pants" they sure look good. They are not fat pants - they are pants that fit the person you are today. You may not be that person tomorrow, or in several tomorrows - someday you will be a different Sherril, and for that Sherril you will make a different pair of pants. Meanwhile, you can't go naked in the classroom, however great a hoot that would be for the 8th (?) grade - just thinking about libido in the 8th grade give me willies! Cheers - and you're on the right track! I'm curious about the CF adjustment you made by pivoting. Does that mean you pivoted it towards the hip of your pattern to create more body space or towards the crotch to add more fabric? I can't figure how you get the extra width in the former without adding to the sides at the hip. Thanks if you have time to answer. Marilly, basically I added to CF. My CF tilted in and I made it more straight, parallel with the grainline. Wow! You look great in grey! Awesome color on you. When you add for your tummy, have you tried adding at the waist in a curve from CF tapering to nothing at the side seams? I don't know where I got that one but it has worked for me. It gives more length to cover the tummy. Maybe it was SB. I can't wait to see your new knock off. I hope one day I can make my own knock offs!